Hey guys!! Thanks to all of you who left sweet comments on my drop cloth tree skirt HERE. 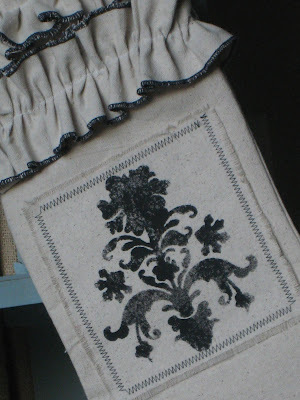 Now I want to show you what I made with the rest of my drop cloth…. 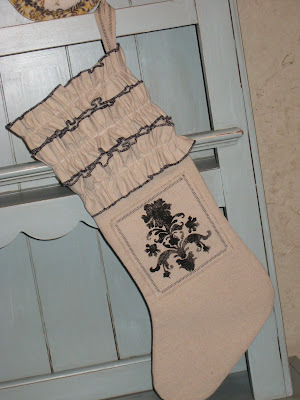 I started by using a stocking I bought at the Dollar Tree as my pattern. I folded my fabric in half and cut the fabric around it. I knew I wanted it a bit longer so I added about 4 inches to the top and I also wanted them a bit skinnier so I didn’t leave any seam allowance. 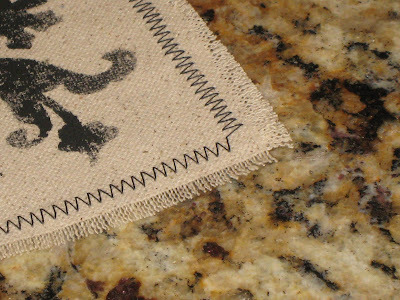 Next I finished the top of each piece by folding it over about an inch and straight stitching. I must add at this point that if I were making clothing or anything else I would finish the inside a bit more professionally but I knew nobody would see the inside and it saved me lots of time:). 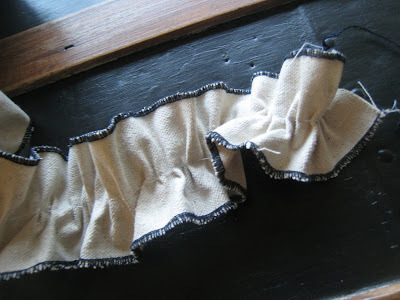 Now for my ruffles…. Woohoo! 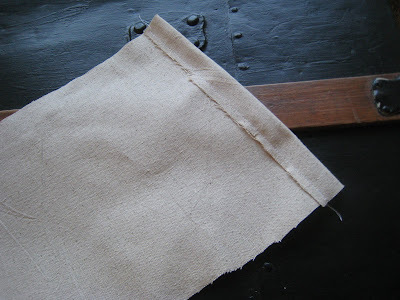 I started by cutting a long strip of my drop cloth about 3″ wide. 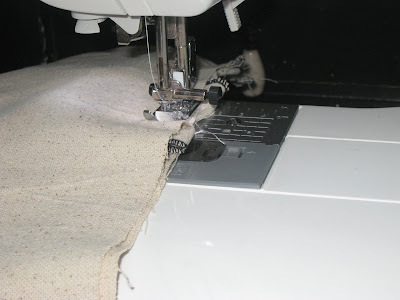 I then ran each side through my serger using a rolled hem. 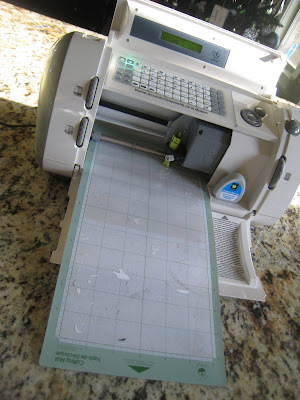 I had lots of messages from you on figuring out how to use your own sergers. I was the same way… at first! 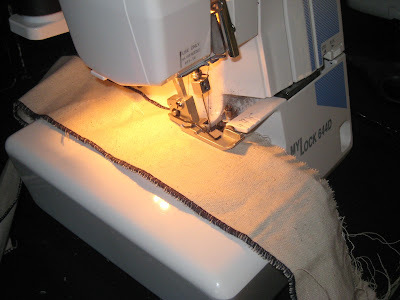 Once you figure out how to thread the darn thing it is much easier than your sewing machine and you will wonder why you waited so long to try it! Promise! 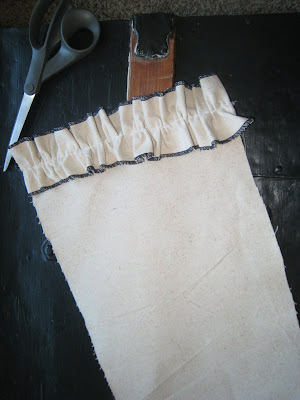 I then started attaching the ruffles to the front of one of my stocking patterns I cut. 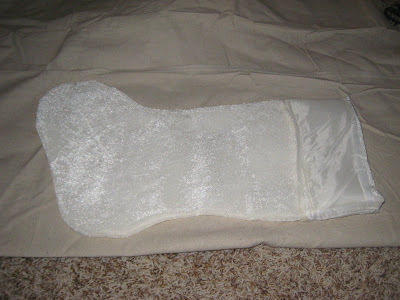 I did this by running a simple straight stitch over the ruffle stitch. The ruffler can ruffle your top fabric and attach it to your bottom piece at the same time, but not when working with heavier weight materials. 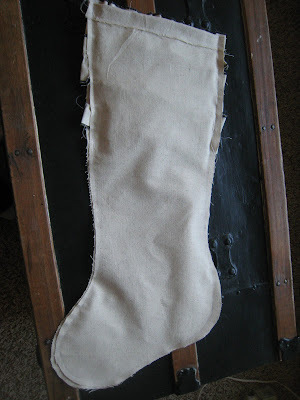 I decided the bottom of the stocking was a bit naked so I dressed it up a bit. Too easy! 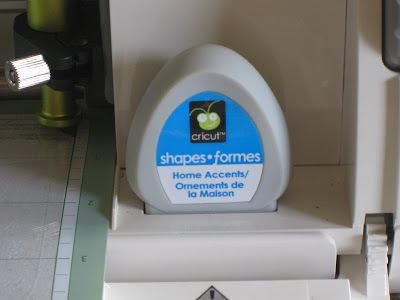 You can check out the Cricut machine HERE see other great products Provo Craft offers! 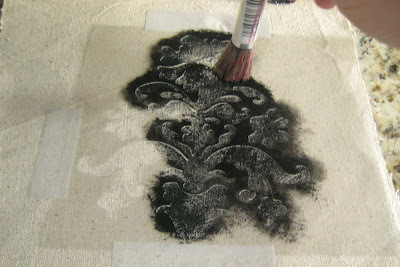 I then used my stencil brush with some black acrylic paint to stencil my damask on a small piece of drop cloth. 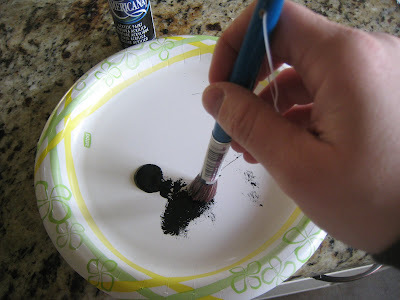 You always want to dab your brush up and down and not side to side to get the best outcome. 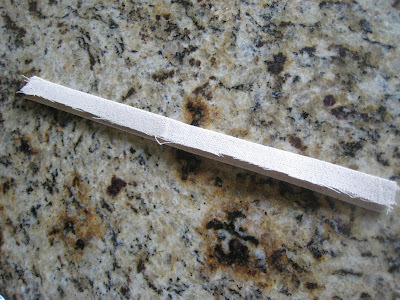 While that was drying I cut another small strip of drop cloth to make my loopie. I just folded into thirds and ironed it down to make it flat. 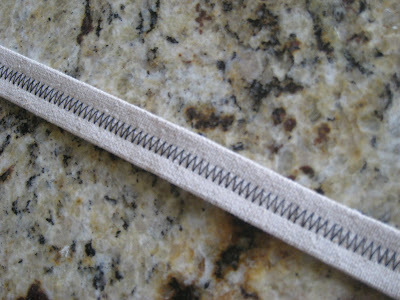 Then I used a black zigzag stitch on top to hold it all together and to make it extra cute! 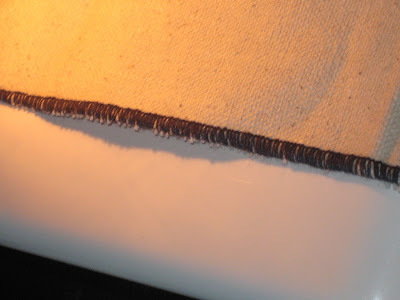 I then also ran a zigzag stitch around the edge of my damask. 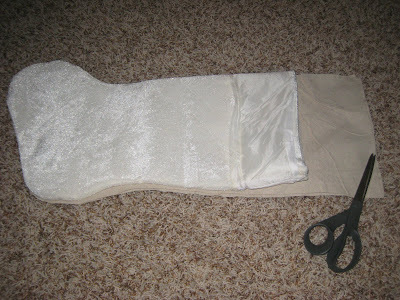 Next I attached my two stocking forms together… good sides in of course. I just ran a straight stitch around the entire edge. Want to see the final outcome…. Now… The very best part (aside from the ruffles) is that I paid $9 for this drop cloth and have already made my tree skirt and stockings. How’s that for shanty! What do you think?? Thanks so much and as always, let me know if you have any questions! I will be linking up over at Hooked on Houses for the Holiday House Tour!!! These are just the cutest thing ever! Found out I am getting a sewing machine for Christmas and couldn't be happier–you have given me tons of inspiration! This is so good. 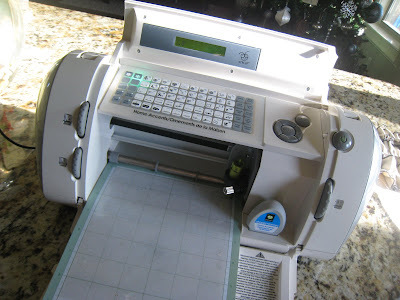 Seriously, I neve considered using my cricut for a stencil. I only use what has been cut out not the opposite. I even have this same cartridge. Love it! Thanks for new ideas and what you do here. I check you out everyday and you never disappoint! Another adorable project from a very talented lady! This is so cute. So cute! I think I need to get a serger. I'm not sure why I haven't except that I seem to manage with just my sewing machine. 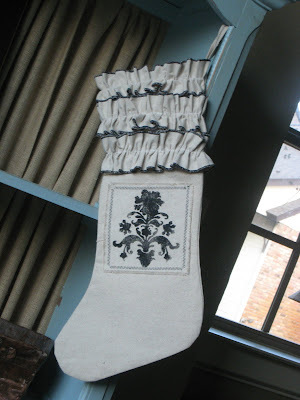 Cute stocking. Thanks for the tutorial. I'm loving the ruffles – very cute. Great job! I love this! Really cute and seems really simple! very very cute! 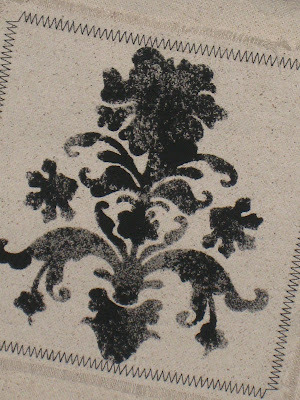 I love the stencil patch! 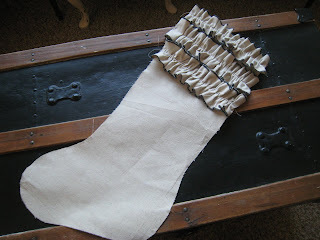 I also love the idea of matching your tree skirt with the stockings. That might get a little dangerous over here though. I'd have a different set for every other year I think. These are just adorable. You have really outdone yourself, and none of the dropcloth was wasted. How devine is that? I just love it. Thank you so much for sharing. 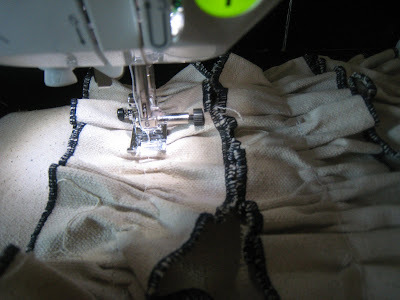 One of these days I hope to get myself one of these sergers. I would so love to have one. Not in the budget yet, but someday. 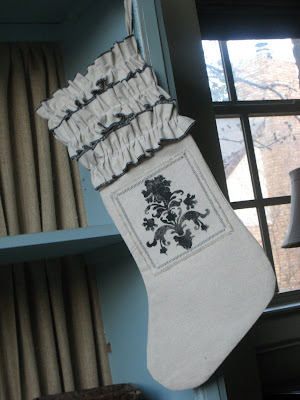 Your stenciling is precious and completes this stocking to a "T". Have a beautiful evening. Please stop by for a visit. I would so love the company. As always – you amaze me!!! I wish I had half the creativity/ability that you and Ashley have! At least I can call you family! Your stocking is adorable!!! I am going to have to try making something out of the dropcloths. They work up really nice. Love & blessings from NC! 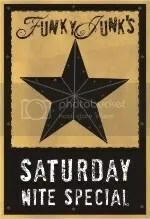 Whitney-girl…you rock to high heaven! I am soooo lovin' that stocking. And I am dying to learn how to use my serger so I can try some of this stuff. If I lived in TX, I would so be having you over to my house for a "sew your socks off" party. Great job as always. 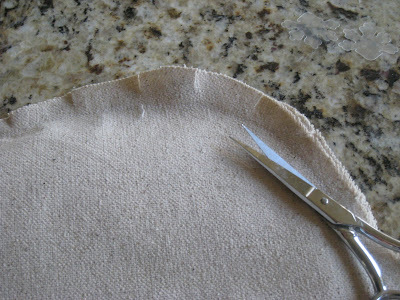 I love using my serger to do rolled hems….easy peasy… I don't have a ruffler YET…. I want one SO badly. I KNOW it would be worth it…. Another awesome idea!! Can I come play at your house? I would love to be as creative as your are. Loving your ideas. Whitney. Seriously? You ladies are amazing. This is gorgeous. I'm all about transforming drop cloths into things, but this takes the cake…or the sock as the case may be. I love it. Great show and tell! Thanks!